Danish art publisher and manufacturer; born at Copenhagen June 4, 1807; died there Sept. 15, 1883. As a boy he was employed in his father's book and stationery store, assuming charge of it with his younger brother at their father's death. In 1846 he set up for himself and became the publisher of many important art periodicals and books, and founded, together with the engraver W. Terslev, a lithographic establishment. Bing also founded a china factory in company with his brother and Frederick Gröndahl, which gained a reputation almost as great as the Royal Danish china factory. In 1863 he transferred his publishing-house to his son and son-in-law. Bing was elected president of the first congress of Scandinavian booksellers in 1856. 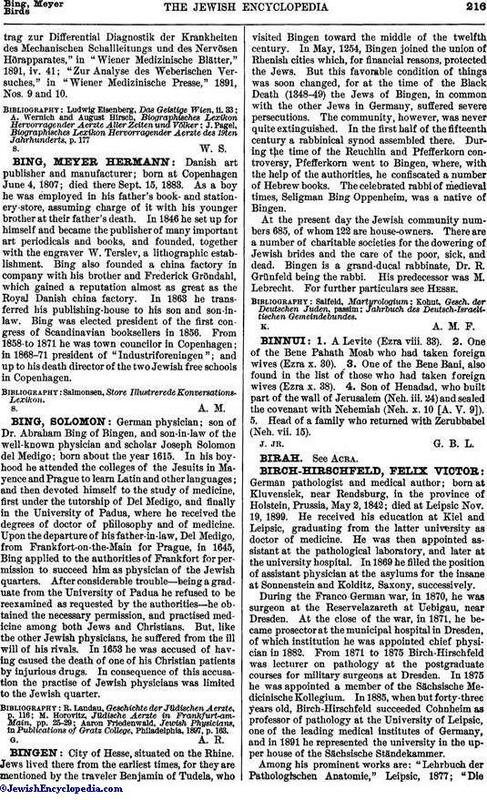 From 1858 to 1871 he was town councilor in Copenhagen; in 1868-71 president of "Industriforeningen"; and up to his death director of the two Jewish free schools in Copenhagen.